Through our unique lawyer-partnership, we can offer to carry your claim to legal collection. 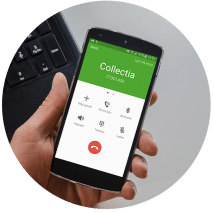 The whole process before legal debt collection can be followed via our online solution. It gives you peace of mind and transparency in the whole process at Collectia. With our Plus and Premium solution we dont charge any court meeting attendance fee up-front. The attendance fee will be charged to your customer and Collectia gets the first payment when we solve the case. The state charge a court fee of DKK 700, which also includes the bailiff’s court fee. The fee will be charged to your client so you can see it as an investment, which you will get back when the customer pays. No unpredictable costs, since you will always be asked whether you want the legal process or not. Should we give you a call? We only need 5 minutes to identify your needs and choose the right solution for you.